Hard floors are a popular choice for today’s homeowner because they are often easier to clean and maintain than carpeted floors. Plus, hard flooring is a more practical option in kitchens, bathrooms, and utility rooms. If your hard floors have lost their luster or you’re frustrated with streaking, grout staining, or a dull finish, The Rug Beater can help bring your hard floors back to life! Our hard floor cleaning services are available throughout Lancaster County, PA.
Get a FREE hard floor cleaning quote! Has your vinyl or laminate flooring lost its shine? We can clean and buff your floors to restore their natural shine. We’ll pay particular attention to high traffic areas and trouble spots including in front of the kitchen sink or under the dining room chairs. Regular maintenance programs are also available to keep your vinyl or laminate floors looking great! The latest styles of luxury vinyl tile have revolutionized vinyl flooring, allowing homeowners to choose durable flooring that closely resembles more expensive flooring materials such as hardwood or tile. In fact, many of these floors are so convincing, some customers actually describe them as hardwood or tile when they contact us about cleaning. While luxury vinyl tile is pretty easy to maintain, many of the designs contain grooves that trap dirt over time. Eventually it becomes more difficult to clean these areas resulting in a dull, dirty appearance. When this happens, it’s time to get in touch with us. We can lift the dirt from grooves and crevices to restore your floor’s natural beauty. Our gentle, high-speed scrubber and pH-balanced hardwood cleaning solution reaches tough dirt and contaminants. Squeegees trap the dirt, and a powerful vacuum extracts it. Our trained certified technicians perform a detailed hand cleaning for the hard-to-reach areas on your hardwood floors. Not only will we leave your hardwood floor cleaner, but we’ll remove an average of 96% of common household allergens. If your hardwood floor is dull or scratched already, there is hope to bring your hardwood floors back to life. In the past, this could only be done through a lengthy and costly sanding and refinishing process. However, advances in technology have now made it possible to restore hardwood flooring with no sanding, mess or time-consuming inconvenience. Our wood floor treatment employs a solution that sands your floor, saving hours of labor. Your floors will be completely refinished in a single day! This treatment is available for a fraction of the cost of complete refinishing and works well for many hardwood floor restorations. However, if your floor has lost much of its stain or has significant stains or damage, this treatment may not work for you. We encourage you to schedule a flooring consultation to see if our hardwood floor treatment is right for you. Ceramic tile flooring has become a popular option in recent years, particularly in kitchens, entryways, and sunrooms. However, one of the biggest frustrations is keeping the grout clean. Ceramic tile grout often collects dirt and stains because its porous finish has not been sealed. Grout sealing is often overlooked since the procedure cannot be completed until the tile floor properly cures, usually in 72 hours. By then, many homeowners don’t want to go through the hassle of having the installer return to do the grout sealing procedure and wait additional time to use their flooring. If you’re struggling with dirty grout or grout stains, we can help! 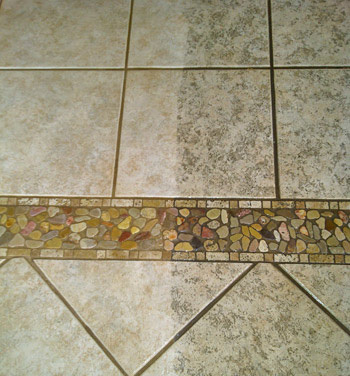 We can clean the grout and the ceramic tiles to bring back their original color and luster. If you’ve never had your grout sealed, we can take care of that step for you too. We can handle tile in any room of the house, whether it’s just one wall in a shower stall or several rooms of tiled flooring. Just about every home has some concrete that could use a bit of cleaning. From your garage and basement floors to the sidewalks in front of your home or the steps by your pool, the Rug Beater can clean all the concrete in and around your home with ease! We can also handle brick walkways and walls too! We use a high-quality pressure washing system that can pressure wash surfaces at up to 3000 psi. Most home units or rentals only provide about 1/2 that much pressure and often leave dirt and unsightly streaks behind. Get the clean concrete you want for maximum curb appeal! ©2019, The Rug Beater. All Rights Reserved.